Practicing medicine in the USA can be very different to how you will have been shown overseas so it is vital that you learn how things work in American clinics and hospitals if you want to practice in the US. Applying to a medical observership in USA hospitals will give you the opportunity to see exactly how things work as well as pick up a little more English language in the process. An observership will allow you to shadow an experienced doctor and to see how everything works from interacting with patients and staff to how and what paperwork is needed within the hospital. This is a very good way also of getting a better chance of gaining a residency place as often they will chose those applicants that they have got to know through an observership over other applicants. Moreover, you may learn more how to apply for observership IMG on our site and find a sample letter for observership. Application form which you should download from the specific program you wish to apply to. Copies of your degree certificate which should be translated into English and notarized. Immunization records and declaration, this should be downloaded from the program you wish to attend. Letters of recommendation from your degree course. Resume, up to date and reflecting the skills they are looking for. Cover letter or personal statement. Why Do Many Fail to Get into Medical Observership in USA? Applying too late: most programs require you to apply at least 3 months before you want to start your observership. Not providing the required documentation: most programs have their own unique requirements for programs so you must always ensure that you review their requirements and provide all that they want. Failing to show a need for your observership: some programs are competitive and require a letter of intent or similar to demonstrate why you want to enter their program. Applying for an observership that you are not qualified for: apply for programs that you have the qualifications for and intend to follow into with your later training. When you learn how to apply for observership in USA you will want to find the right programs for you. While there are some programs that allow you to apply to multiple institutions most will require you to apply directly to them if you want a place. Prices and the length of the program also vary considerably. Cleveland Clinic: they offer a 4 week rotation at a cost of $1000. You could, however, receive a letter of recommendation at the end of the program. UT Southwestern: this program offers up to 6 weeks of observership and you can select different specialties to observe. University of Missouri Hospital: cost is $500 for a 12 week program. As with most observerships you will be only able to watch and not participate. University of Pittsburgh Medical Center: this is an 8 week program at a cost of $5000. You will however get to discuss many things with the physician such as care plans and become familiar with electronic records etc. George Washington University Hospital: this is an 8 week long program that will provide you with a full overview of the US health system. Getting accepted for a clinical observership in USA programs is not going to be easy, especially if your English skills are not perfect. Having your application written by our experts will help to ensure that you gain the best possible chances of being accepted onto your chosen observership. 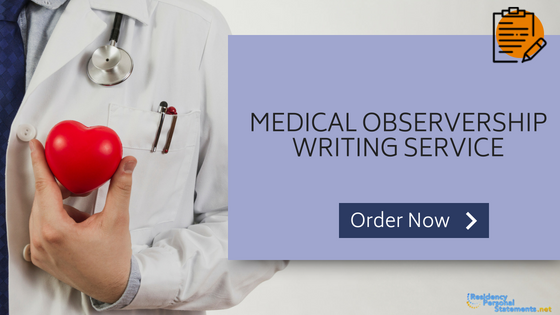 Our services are available around the clock and through us, you will get to work with one of the very best writers with a huge amount of experience in successful observership applications. You will get expert help with personal statement for residency, whether you are interested in neurology, hematology or orthopedic surgery. Get onto your chosen observership in USA with the help of our professional and knowledgeable application services!